Super Wax Off | Pro Chem, Inc.
SUPER WAX OFF is a specially formulated concentrate with a unique “chemical key” that unlocks the molecular structure of the old finish, enabling the wetting and penetrating agents to dissolve and float away all remnants of entrapped soil, stains and waxes. 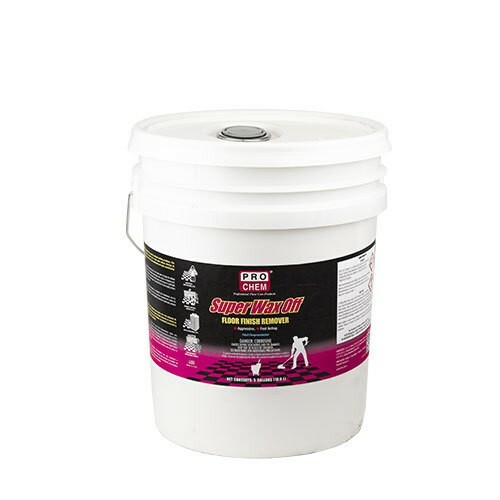 It is completely soluble in hot or cold water and is non-damaging to all types of composition floors. After rinsing with clear water, floors are left stripped, clean and ready for a fresh coat of a Pro Chem seal or finish. Dilute 1 part SUPER WAX OFF to 4 parts water. Apply the diluted solution directly to the floor scrubbing vigorously with a mop or stripping pad. Allow to stand 5 to 10 minutes or until wax has been dissolved. Remove dissolved wax from floor with a mop, wet vac or automatic scrubber. Rinse floor twice thoroughly with clean water. Let floor dry thoroughly before applying new finish or sealer.